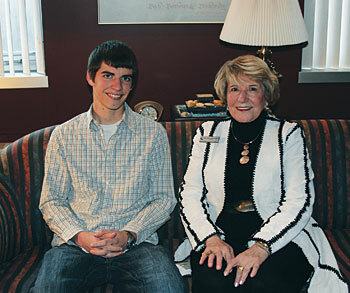 College President Dr. Faye Pappalardo has selected 2009 graduate John Biondo, Jr. as the recipient of the President’s Academic Excellence Award. The award, which is presented at Commencement, is a scholarship for $500. To be eligible for the award, a student must complete at least 45 Carroll credits, have a 4.0 average, and have been recommended by the faculty. Faculty praised Biondo for being well-prepared for class and a “pleasure to have in the classroom,” and as a student whose work was of superior quality. The Hanover, Pennsylvania resident is a business administration major. He is interested in a career in accounting. Biondo plans to transfer to Stevenson University for a bachelor’s degree and eventually wishes to pursue his C.P.A. Biondo is the second oldest boy in a family of five siblings. His sister, Jeanna, also graduated from Carroll, and then from Stevenson University. Award recipient John Biondo, Jr. with college President Dr. Faye Pappalardo.